Tinicum Township will celebrate its annual Community Day 1-8 p.m. Saturday, Nov. 24 on the riverfront at Governor Printz Park. The rain date will be Sunday, Nov. 25. The celebration will be preceded by a 5K walk/run at 12 noon. Registration begins at 11:30 a.m. in the park. Registration is $25 and all proceeds will benefit Cancer vs. Cancer and a few Tinicum families who are struggling with medical bills. 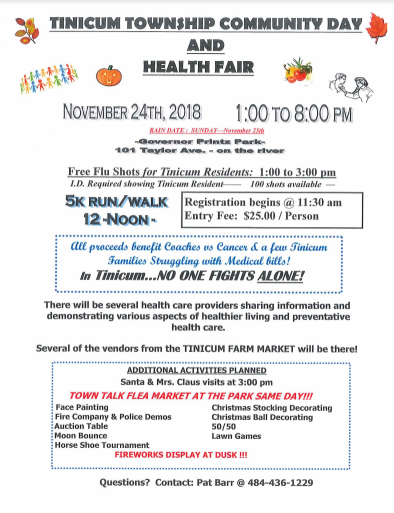 The day will also feature a health fair, with free flu shots for Tinicum Township residents from 1-3 p.m. Everyone must have an ID to get the shot. There will be a variety of other health care providers on hand, sharing resources and information. Santa and Mrs. Claus will visit with the children at 3 p.m. The annual Christmas Tree Lighting will be held at dusk, followed by a fireworks display.